The other day, I wrote about Gus sitting in the window of my bedroom and enjoying the warm sun. When evening comes, my bedroom window is not a warm hangout anymore. I run the air conditioner most of the afternoon and evening, so the bedroom cools off at night. 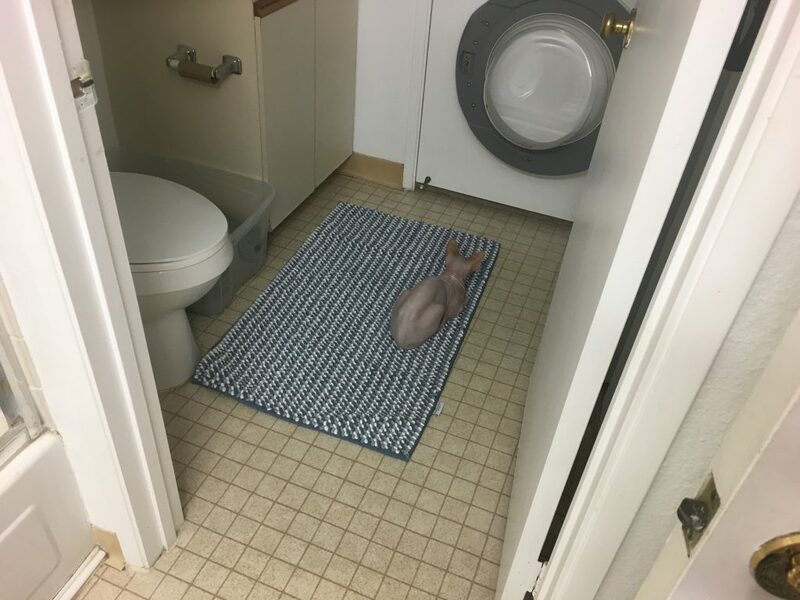 Gus’ search for a warm hangout place leads him to the guest bathroom. He will sit there until I go to bed. The he’ll join me and sleep under a blanket. I just washed the rug yesterday, so it’s nice and clean. Awwwww, he looks so content. That room has everything he needs. I see there’s no toilet paper – is that because he eats it like Wally does?